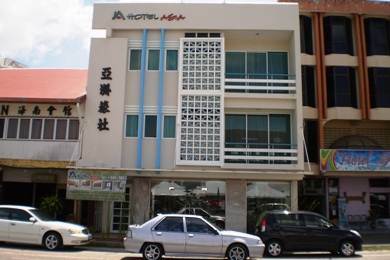 If you are looking for a budget accommodation in Kuah which is not in a crowded noisy place but still within easy walking distance from the center of the town, the Kuah Jetty and several duty free shopping centers and restaurants, and one that offers nice clean and cozy rooms, then Hotel Asia can be a good choice. We stay here exactly for these reasons which are further complemented by nice modern amenities and comfortable beds and very nice & friendly staffs. The hotel is located on the road Jalan Persiaran Putra which goes all the way to Lagenda Park and the Kuah Jetty towards south which are both in walking distance. But this part of the road is relatively less noisy and there are not many cars zooming around, but there will be some though. The reception and the lobby area is small but quite cozy. There are sofas at the lobby to relax on. As soon as you walk in, the friendly staff at the front desk and the manager will greet you with a smile and helping you with the check in, although sometimes they can be a bit slow. There are only 18 rooms that are laid out in two floors (first and second) above the lobby level. If you are looking for quieter rooms, then ask for the ones facing the backyard with some nice greenery. The rooms are not sound proof, so the road facing rooms will have some noise of the passing cars, and at nights it my not be quite desirable. Although Superior Double rooms are the cheapest and come with a double bed for two, they do not have windows. I would feel a little claustrophobic in these rooms although like all other rooms, these are also quite clean and have all the basic amenities. Deluxe Double rooms have double bed, Deluxe Twin rooms have twin beds, Executive Triples have a double bed and a single bed accommodating three persons, the Family rooms have two double beds that are good for a family of four. All these rooms have windows. Now coming to the in-room amenities, although Hotel Asia is a budget hotel, it makes some nice offerings which you won't find with run of the mill hotels of the same category. All rooms are spotlessly clean and well maintained, the bathrooms are simple but have adequate space and come with rain showers, bath gel and shampoo, clean towels, hot showers (individually operated and not centrally) etc. Additionally all rooms have individually controlled air conditioner, LCD TV with Astro channels, Internet Access, a cute desk with a chair, tea/coffee maker kettle (3 in 1 coffee filled up every day), water bottles, hair dryer, Iron & Board etc. Although the hotel has no in-house restaurant or cafe, there are plenty within easy walking distance. As you come out of the hotel, turn right and you will find Lata Bali, a restaurant offering nice food and drinks. For a cheaper option, just cross over the road and next to the Pizza shop there is a Nasi Kandar restaurant selling local Malay food - nice and cheap. Have Roti Canai (a pancake that comes with curry), and a coffee there... it's really nice. There is a Mc Donald outlet within 15 minutes walking distance. The Kuah Jetty is towards south (walk left once you come out of the hotel). It takes only 20 minutes by walk or just 5 minutes by taxi (RM6). Do not ask the front desk to call a taxi, they take their own cut of RM4. There are many duty free shopping stores and restaurants within 15 to 20 minutes walk from the hotel. You can also easily walk down to the Night Market. The front desk staffs will help you arrangw or even guide you with any island tours or activities you may like. They do it at a very reasonable rates or just connect you with the operators. 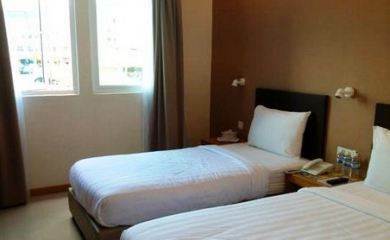 Staying close to the hub of Kuah and enjoying cozy night stays with all modern amenities at a reasonably cheap price - Hotel Asia is value for money. Rooms are clean and bathrooms are nice as well. The staffs are really friendly and helpful. This hotel is ideal for short stays for a solo traveler or even a couple. There is no elevator in the hotel. So carrying your own heavy luggage to the upper floors can take some effort. If you have seniors with you, then take rooms in the first floor. A hand given by the staff to carry the luggage can help a lot. If you have a noisy neighbor, you can have sleepless nights. Better sound proofing would help. Even the passing cars are nuisance at times. Hotel Asia Langkawi is only 5 minutes by taxi from the Kuah Jetty and 30 minutes from the airport.